Despite a lifetime guarantee and a great formulation that makes sense, Zenwise Health Sleep Support lacks the hand-on customer support and detailed FAQ that would truly make both the product and brand a cut above the rest. The company behind this sleep aid was founded just a few years ago—in 2014—but already it’s gone through a brand name and logo change. We ran into some difficulty during our research phase because the product we had shortlisted was named Zenwise Labs Sleep Support; and although all of their social media accounts still carry the Zenwise Labs name, the products and the official website have re-branded to Zenwise Health. Whatever the case may be, the company maintains the same commitment to provide a diverse and innovative range of products for the personal wellness to those in need of them; while promising what they call a “zen-like” experience with product quality and customer satisfaction. Zenwise Health has over 20 products available in the market for a variety of health concerns: cardiovascular support, join and mobility support, weight management, and more. Three formulations are specifically for sleep and relaxation: 5-HTP, Magnesium Citrate and Sleep Support. Zenwise Health Sleep Support is a potent, all-natural formulation that can help adults maintain sleep health by promoting deep and restful slumber without sluggishness upon waking up. The idea is that when you sleep easier and steadier, your sleep-wake cycle benefits and you feel more refreshed and energized overall. Worth noting that it’s called Sleep Support but it is marketed as a “calming supplement”, too. Many sleep aids lists calming and relaxing effects among their benefits, of course; but Zenwise Health makes a point of highlighting the fact. Unlike some counterparts, Sleep Support is not explicitly stated as a dietary supplement that you can take for occasional sleeplessness or jet lag. Faster sleep onset isn’t mentioned, either; although the formulation shares many ingredients with sleep aids that do help you sleep faster. As with every dietary supplement we review—regardless of its reputation or available information online—we feel it’s our duty to remind you that you need to consult your physician before adding Zenwise Health Sleep Support to your daily intake. Even if it’s not a long term addition, new supplements still may affect an existing medical condition, or even interact with maintenance drugs or dietary specifications. You may not be able to predict these effects, but a trusted healthcare professional will be able to point out possible complications. 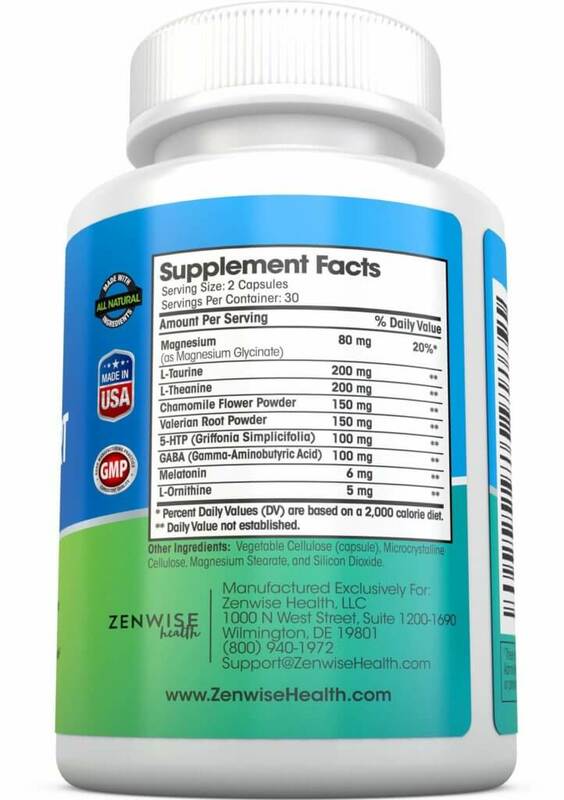 Zenwise Health Sleep Support is a vegetarian-friendly supplement that contains a blend of amino acids, plant-derived extracts, Magnesium, and Melatonin. Many components here are ingredients we’ve seen before in previous reviews of other sleep aids, though one or two are unique. First, let’s look at the foundation on which the entire formulation is based: Melatonin, the naturally occurring hormone that regulates the human body’s sleep-wake cycle. There’s 6 mg of it in one full dose—two capsules—which is more than what Source Naturals NightRest offers, and the latter already matches extra strength single-ingredient doses of other brands like Natrol and Vitafusion. The same amount of Melatonin is in Nested Naturals LUNA, but Nested Naturals specifies that the dosage can be one or two capsules; Zenwise Health insists on two. Now, the amino acids: 5-HTP, GABA, L-Theanine,Taurine, and L-Ornithine. We’re already familiar with L-Theanine—found in green tea—as well as GABA and 5-HTP, both found in the human body. This triumvirate is also in RMB Naturals Restorative Sleep Formula; all three work together to reduce anxiety and stress and improve sleep. Taurine is an uncommon ingredient in sleep aids, but not entirely unheard of; it works in tandem with GABA, as its function is to activate GABA receptors in the brain. L-Ornithine is the standout amino acid, as it’s not really a sleep aid component; it’s used by the body in the urea cycle, but it purportedly also brings about anti-fatigue and anti-anxiety effects. As far as botanicals go, there’s Chamomile and Valerian Root. Chamomile is one of the most common herbal additions to sleep aids for young and old, as it is gentle and popular even in tea form. In contrast, Valerian Root is usually reserved for adults; or if not, used sparingly when given to children. It is a potent herbal remedy and a strong sedative; so much so that, like Melatonin, it’s popular as both a dietary supplement component and as a single-ingredient product. Curiously, Zenwise Health notes that the inclusion of Valerian Root is for stress management. Finally, there’s Magnesium—800 mg of it, which is well below the Recommended Daily Allowance (RDA) for adults. It helps to calm your nerve and relax your muscles; and like Taurine, it aids in the maintenance of healthy GABA activity. Zenwise Health claims that on top of being vegetarian, the supplement is gluten-free and very low in allergens; although they do recommend asking customer support directly for questions regarding food and ingredient sensitivities. Zenwise Health suggests two tablets taken with eight ounces of water, 30 to 60 minutes your desired time of sleep. They do also state that a healthcare professional may change the dosage instructions as they see fit for your particular needs. The typical warnings apply: Don’t exceed the recommended maximum dosage. Don’t take with alcohol. Don’t drive or operate machinery after dosing. Don’t take if pregnant or nursing. Do not use if suffering from high blood pressure or heart disease. One contradiction we’ve found in the the way Zenwise Health promotes Sleep Support concerns the subject of age. On the label itself, the company warns against the use of this product by children and teenagers under the age of 18. However, on other websites—such as Amazon—the company states that “kids or adults” can take the dietary supplement. While the amount of Melatonin is quite high, the dosage does come in two capsules. Taking a half dose may be better for people who don’t need a strong sleep aid, and it also makes the purchase easier on your pocket; because half doses mean that the product lasts twice as long. Of course, this is all subject to approval from your personal physician. Also: If your problem is sleep onset and not sleep quality or sleep duration, you may want to look for a product that markets itself as a potent sleep inducer; Zenwise Health Sleep Support has the ingredients for it, but it’s not really formulated for that. There is no content about possible side effects available on the official company website. In fact, there’s no real FAQ or help center, or even a detailed description of Zenwise Health Sleep Support’s formulation and development. True, the company and the product are both new; but this is not enough of a reason to be remiss when it comes to this kind of information; especially because they value transparency. In the absence of an official list of possible side effects, we combed through hundreds of product reviews left by customers on sites like Amazon and iHerb. Some side effects mentioned include: anxiety, grogginess, or headaches the next day. However, it’s important to note that these are isolated cases and not in any way common. Side effects—and even product efficacy—will vary from person to person. Zenwise Health Sleep Support is available on the company’s official website; they maintain their own online store. It’s also listed by Amazon and iHerb. There seems to be no listing of physical stores that carry Zenwise Health products. There is definitely potential in Zenwise Health Sleep Support—the formulation looks to be well thought out, and it’s certainly different enough to be considered a product that its truly unique to Zenwise Health. The ingredients make sense; even looking up the components one by one shows up studies and other literature that links each to possible sleep support use—or, at the very least, stress and anxiety relief. As for promise, though, there doesn’t seem to be much of that involved. It may very well be that we’re reviewing Zenwise Health Sleep Support at an inopportune moment—it feels like the company is still in the process of re-branding—but as of now, there’s not much to go on. There isn’t even an official press statement regarding the change of logo and name. Even the company’s social media is noticeably silent these days. However, the official website is updated, and the products are still available online. We know from the official website that they are very much for transparency, quality and customer satisfaction; we just hope that there’s more evidence of this in the coming months and years. Zenwise Health supplements are made and developed in the US; in FDA-registered facilities, which are both GMP and NSF certified. Raw ingredients are said to be locally sourced and tested; which helps when it comes to purity and potency verification and authentication. There is no further explanation past these facts; no details on possible third party testing, batch quality assurance, or laboratory procedures. Sometimes it works, and sometimes it doesn’t; although product reviews are still generally positive. On Amazon, it’s rated a respectable average of four out of five stars; but less than 75% of respondents rated it over three stars. That means that one fourth of the people that tried it found something lacking in the product. As we went through each review and comment, we saw—as we mentioned earlier—incidences of post-sleep anxiety, grogginess and headaches. Some people also mentioned waking up in the middle of the night and having difficulty going back to sleep; or having to take three pills to get any kind of effect. These, of course, are on top of the typical negative review that just states that the product simply didn’t work as promised. This is not to say that Zenwise Health Sleep Support is a bad product; far from it, as the ratings show. It may just be that its effectiveness is not as widespread as some of its competitors. Customer Support options are varied. There is a contact form on the official website, as well as a listed email and toll-free telephone numbers. Social media accounts, as we’ve previously mentioned, seem to be inactive at the moment. Zenwise Health representatives also reply to reviews on Amazon. There is a return policy—and it’s a great one, too. Zenwise Health is one of only two companies we’ve come across doing these sleep aid reviews that offers a lifetime money-back guarantee for all of their products; the other is Nested Naturals. Basically, if you purchase a Zenwise Health product and are unsatisfied by it, the company will give you a full refund—no questions asked. Visit Amazon & Find Zenwise Health Sleep Support Deals Now! 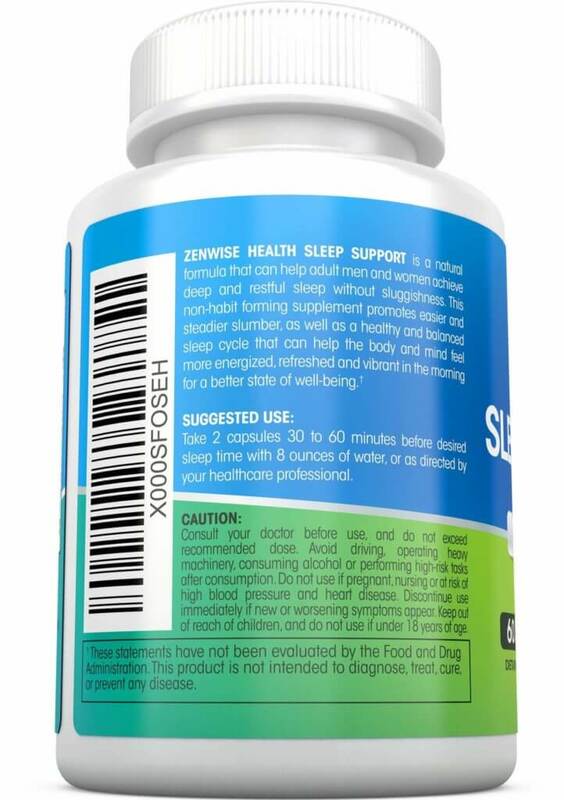 Zenwise Health Sleep Support is sold as a plastic bottle holding 60 vegetarian capsules. This is enough for one month of continuous use. Price points differ based on where you’re purchasing it. For example, as of this writing, the prices are: $17.97 on the official website, $17.98 on Amazon, and $15.27 on iHerb. We admit that we were thrown off by the name and logo change, as well as the inactivity of Zenwise Health’s social media accounts at the moment. The lack of a decent FAQ and a well done section on development, testing and quality assurance processes worries us, too. However, a good product is a good product; and all signs point to this being one—at the very least, three out of four times. And if you happen to be one of the exceptions—if the product does not work for you—then you can always avail of the lifetime guarantee. Even without that safety net, the price point is low to average; definitely worth a try if you are looking for good sleep support and have tried more generic formulations already. This unique blend of amino acids and plant extracts boosted by Magnesium and Melatonin might just do the trick.